But I haven’t thrown caution to the winds — I am planning ahead with my purchases. The red polka dot is going into a Soldier quilt for Alycia’s No Soldier Forgotten project, which will be one of my HeartStrings projects this year. The turquoise is for my older daughter’s birthday quilt, and the plum, violet and green are all for UFOs that I plan to finish this year. My total fabric bought is 2.5 metres, which translates to about 2.75 yards. I haven’t done any real sewing this week, but I am hoping to make a start on something this afternoon! Got that design wall to think about for tomorrow! 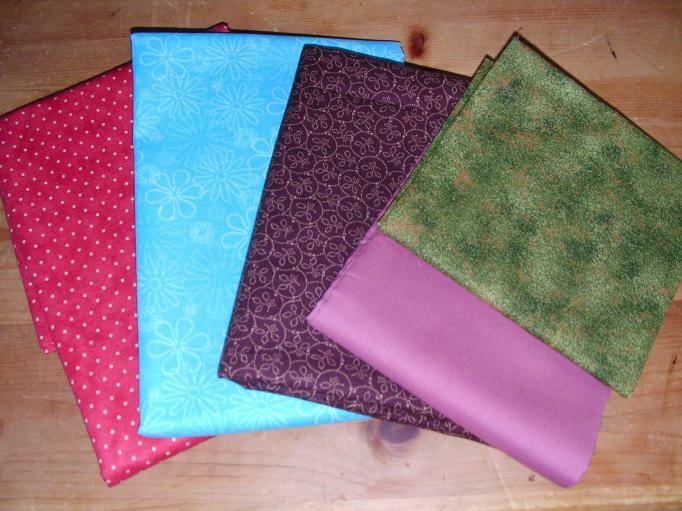 To read about other quilters’ Stash Reports, please visit Judy’s blog. Well I am sure you will be in the positive before the year ends. Sounds like you have wonderful plans on stashbusting as well. Glad I’m not the only one starting with more purchased than used for the first week, I’m feeling great with company of some good friends (smile). Isn’t it funny how you feel like you need to have a plan for all you buy when you are keeping track and being accountable to others? It has been GREAT for me…no more discriminant buying! Can’t wait to see how this fabric makes up. Well, look at it this way: You can’t bust anything unless there’s fabric to bust! 🙂 🙂 Great purchases! Will be watching to see what is made from them! I think your doing good in the stashbust department. I don’t think its about never buying…..to me its about shopping the stash first, then if there is anything you need, then buy that whats needed. I’m sure you will be postitive before to long. Thanks for visiting and joining in with the 2010 BOM. It was nice to put a name to “rosewillow”!! I am also planning on completely at least 3-4 QOV tops this year, one of them coming from the BOMs. I love the colours of that fabric. I would have bought some too. I’m sure you’ll use it up in no time. Very pretty purchases! I’m sure you’ll bust that fabric in no time finishing UFOs and making quilty gifts. Love the colors of your new fabric – and you have 51 more weeks to go and bust fabric! I’ll be in the negative soon myself. 🙂 How wonderful that you are participating in the No Soldier Forgotten project. What a good way to put your stash to use! when you have specific PLANS for fabric it’s a good thing. I fall down on those “I think I’ll use it and I just like it” purchases!